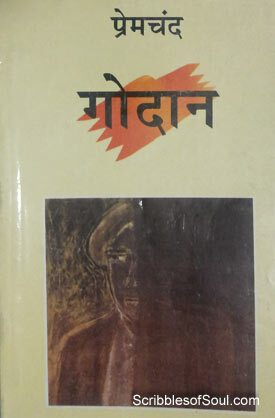 Godan by Premchand is one of the most famous novels written by the stalwart writer of Nirmala and Kayakalp. Literally, ‘Godan’ means donating a cow, and in Hindu religion, it is perhaps the most essential funeral rite, without which a person can not even think of salvation. The tradition dictates that a cow is essential to cross the “Bhavsagar” and by making Godan, originally an actual cow, but now a few hundred rupees may also suffice as a token rite, one can ensure a place in heaven for the departed soul. However, Munshi Premchand has deftly played on the meaning of Godaan. He has increased its scope from a religious rite to the epitome of mirage, a symbol of unattainable ambition, that each one of us aspires for, but only a few can actually achieve. In Godan, I found a continuation of the exploration of human nature that Premchand began in Kayakalp. If in Kayakalp, he emphasized upon the difference between thoughts and action, exhibiting how easily a person’s ideals can be transformed with the change in his circumstances/status/position. Here, in Godan, he completes the circle by showing that even changes are transient, the deviation or belief in ideals are only temporary, a sham, a veil to cover one’s cowardice. In reality, every man lives life as per his conditioned mind, largely governed by his upbringing and circumstances. The half baked truths that are ingrained on a child’s innocent, impressionable mind, never leave their marks. They continue to torture him in youth, and acquire a stubborn permanence in old age. So, a man who is born rich, may think of money as dirt, a burden, an obstruction in his path of being a good man but, try as he might, he would never be able to spend the same for the benefit of others. In actual life, the characters of Kanhu Mohanty’s Storm, can never exist. The wealthy ones would never be able to evade the charm of status, position and money, howsoever benevolent and altruistic, they may claim themselves to be. Similarly, a man born in abject poverty, continues to remain hungry, even if he earns a decent amount of money. More often than not, it becomes a hiccup in his smooth, tension free life. And, before, he could taste and savor his success, he succumbs to liquor and luxuries, squandering what little he had, and is once again forced to squirm in front of blood sucking money lenders. These differences have existed for centuries, and as I read Goudan, written almost 100 years ago, I marveled on Munshi Premchand’s ability to present these thoughts, in a wonderfully woven tale, revolving around poor Hori, angry Gobar, double faced Raisaheb, loose moraled Khanna, idealistic Mehta, opportunistic Onkarnath and self effacing Malti! They may be insanely rich or unbelievably poor, but each of them harbors an ambition, a goal they wish to fulfill. Most importantly, none of them is innocent to human vices of greed, ego and anger. They are normal human being, well suited for the lives they live, adhering to social diktats, yet breaking boundaries in their own inimitable manner. Frankly speaking, the novel exhibits two extremes of life, one is the harsh, debt-ridden village life, striving to feed and clothe their starved selves, and the other is the luxurious, lazy life of wealthy people, who are yearning to free themselves from the boring, bland, comfortable existence. Strangely, both the worlds aspire to break their niche, but are afraid of the new lives they hope for. While poor can only live within their small circles, bounded by religious superstitions and social sanctions, the rich can destroy an entire village at their whims and fancies, indulging in hollow socialistic propaganda, sucking blood of natives in true feudal style. And, this is what I exactly liked in this novel. The characters are life-like, their stories familiar, yet their intermingling a novel experience. The story begins with Hori’s desire to buy a cow and ends with his unfulfilled aspiration, and in between so many characters, plots and angles were introduced, that at one time, I seriously wondered how would Munshi Premchand ever be able to complete the novel. It seemed a mirror image of life that goes on despite the arrival of young ones and departure of old. But, commendably the novel was concluded well, though I was left desiring for more, as I could not bear to part from the wonderful characters. I became a fan of Mehta’s controversial yet honest facts, Malti’s radical transformation from a selfish, modern woman to a genteel soul and the steadfastness of Hori’s belief in patriarchal sense of responsibility. When he helped Punia, even after her husband killed his cow, I felt indignant at his meekness and stupidity. But, when his son Gobar reprimanded him for his foolishness, I felt a surge of sympathy for the poor, hardworking though manipulating Hori. He touched my heart and is perhaps the most realistic character, I have come across till date. He is not your everyday innocent villager, most of the novels portray, but a worldly wise man, who does not hesitate from making false promises to Bhola and sood-khor mahajans, and yet is God fearing enough to give up his claim on the crop, to escape the wrath of a Brahmin. He is a symbol of all the good and evil that lies within a man, and based on the circumstances, the good or bad side takes over. Dhania, Jhunia, Rupa, Sona, Silia, all the village belles had some magnetic charisma, and had the story been continued, each of their lives could have been explored endlessly, adding hundreds of pages to this treatise of human emotions and his idiosyncrasies. The novel is fantastic and its greatness can hardly be summarized in this short review. I have not divulged the story, as I feel it would be injustice to even try to reproduce this wondrous tale. As with life, each one of us should explore it for himself. Though, the first time Hindi readers may find the narrative slightly difficult to follow, as it is written in Avadhi dialect, abundant in local slang and twisted mispronounced English words, that actually gives the novel a very realistic, rustic flavor. Munshi Premchand has peppered Godan with love, romance, comedy and tragedy in equal dose. Needless to say, I just loved this novel and can read it again and again without getting bored. Godan is truly life-like, neither pristine white nor depressing black, but a healthy glowing grey! Yes, in the very beginning itself, he bought the cow. But she died soon enough, and he kept dreaming of buying another one. But kuldeep, actually cow is just a metaphor in this novel, each one of us have some dreams and ambitions, at times, impossible ones, but we are too naive to understand it and keep following them. Thank you very much anu . Which was the best character and why?